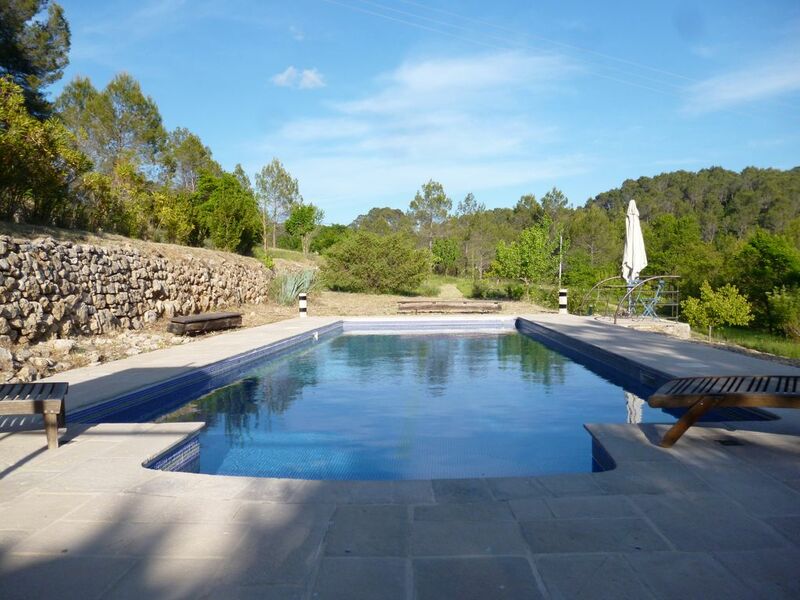 This beautiful house is situated on a large quiet plot (6000 m2) without neighbors. It is an ideal romantic accommodation for a peaceful holiday. It is a typical Provence house, which I have renovated myself with much love. The house is small (about 60 square meters), so it is ideal for a summer holiday, since you are little inside. There is a large patio between the two halves of the house (about 30 square meters) with sunbathing areas and a large table. In front of the house is a large linden tree that provides shade. There is also a table under an old glycine. It is an ideal place for lunch as there is always a light wind blowing. At the pool (12 x 4.5) you will find another shady area with 4 wooden loungers. The pool lighting is infrared controlled. The property has 34 old olive trees and numerous fruit trees such as mirabelles, apricots, peach, walnut, plums, cherries, almonds, figs, persimmons and oleander, laurel, plane trees, gingko, eucalyptus and a large linden. The herb garden will be recreated in spring 2017. The village, for shopping, with typical village square with large plane trees, is a few km away. This house is not just any rental property, but the house we moved to in the fall of 2016. So I ask you to treat it as if it were your own. For all questions and problems you will be taken care of immediately. We are always available for you. Both bathrooms have been lovingly furnished and tiled. Washcloths and towels plentiful and available in good quality. Une pause loin de tout ! Nous avons aimé la quiétude des lieux, au calme, loin de tout. Une maison simple ouverte sur la nature où chacun trouve son espace. Merci à Ivan pour son accueil et sa disponibilité pour nous facilité un bon séjour. This is a wonderful little holiday house with a spacious and clean swimming pool. We had a very nice stay in this typical french stone house and the pictures delivers the truth to what you really get. We stayed two adults and two smaller children. The house has a very lovely terrace where you can stay in the shade almost all day. It is a quiet neighborhood, a little remote, but close to the two beautiful mountain villages Bargemon and Claviers- with good restaurants. You can reach Lake st Croix in 50 minutes by car. It is the most beautiful drive through the mountains. If you are interested in French wines and olive oils, there are very good shops in this area. We had a very nice and relaxing holiday- and the children loved the pool. We communicated very well with the owner before arrival. We also wish to thank you the house lady, Jewels, who was very helpful during our stay. Thank you very much. Wir verbrachten einen wunderbaren Urlaub in Claviers. Das Häuschen ist wirklich wundervoll und liebevoll hergerichtet und der Pool war einfach fantastisch. Die Stille war einfach unglaublich und wenn man - wie wir - aus der Stadt kommt, kennt man dies so nicht. Wir waren restlos begeistert. Und dann ist da ja noch Ihre Hausdame Julie "Jewels", ein wahres "Juwel". wir hatten ein wunderbare Woche in diesem schönem Haus in der Provence. perlet für einen romantischen Aufenthalt. 2 jaar geleden zochten we een vakantiehuisje voor ons gezin in de streek van de « Var ». Onze 1e vereiste was, volledige kalmte en alleen op een domein én met natuurlijk een zwembad erbij. De eigenaar van de woning had ons verzekerd dat zijn huisje « het huisje » was dat we zochten. Wanneer we arriveerden, zagen we voor ons “het droomhuisje”, waar we al jaren naar op zoek waren. Met onze 2 kinderen erbij, hebben we daar een onvergetelijke vakantie doorgebracht, ééntje om nooit te vergeten. Alles wat we verlangden, was aanwezig. Mooie kamers die héél romantisch zijn ingericht, héél mooi. De keuken héél groot, badkamer mooi en volledig in orde. Van het open terras, veranda “de grange” hebben we veel kunnen genieten, telkens tot laat in de avond. Het zwembad was top ! Kortom, dit is het huisje dat wij zeker bovenaan op ons lijstje van vakantiehuizen gezet hebben. Het was zo’n onvergetelijke vakantie toen, dat we dit jaar opnieuw zijn geweest. The house is just below the old village of Clavier. You can ride with the car, but there is also a very nice walk (15 mn). Clavier is a very quiet and typical Provence village with a nice bowling alley, 2 restaurants, a bakery, a small grocery store, a pizzeria and an old chapel, held at the art exhibition. 5 km from the house is the village of Bargemon, where you can buy more. There are numerous art galleries and museums 4. The village square is very charming with its old fountain. You can find 25 Km. From the house the Gorges du Verdon, which you can practice kayaking and rafting. On the way to Figanières, there is a horse and Poneyhof for children. 25 km away is the village Bargème, which is one of the most beautiful villages in France. Earthenware is 20 km. away. There you can fly sailing and golf. In all these villages there are excellent restaurants with affordable prices. Alain Caro and Philippe da Silva have ever even a Michelin star. The legendary les terres blanches golf course is worth seeing even for non-golfers. Under the following Web site for more information about the area.